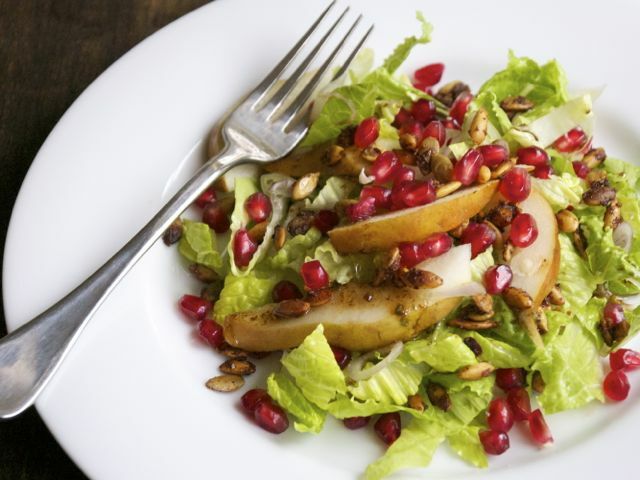 This is a great wintertime salad, with the pomegranates that only appear around the holidays and warming pears and pumpkin seeds. Vegans can just leave out the cheese and enjoy the crunchy spiced seeds instead. To take the seeds out of the pomegranate, cut through the skin from stem to tip, dividing the fruit into quarters. Hold the fruit over a bowl and pull apart the sections, then tear apart the pieces, gently freeing the seeds. Make the pumpkin seeds: Heat the oil for a minute in a medium nonstick skillet. Add the pumpkin seeds and toss in the pan over high heat until the seeds are popping and browning, about 3 minutes. Remove from the heat and add the brown sugar and toss constantly until the seeds are coated with melted sugar (be careful; the sugar will burn easily). Quickly mix in the salt and spices, then spread the seeds on a plate to cool completely. Store in an airtight container until ready to use. Make the dressing: Mince the garlic and mint (if using) in a food processor. Add the pomegranate concentrate, lemon juice, honey, and salt, and pulse to mix. Gradually drizzle in the oil with the machine running. Make the salad: Wash and dry the romaine, then slice across the leaf in ½-inch-wide strips. Arrange on plates or in a bowl. Top with the shallots, pears, and cheese. Drizzle over the dressing and top with the pomegranate seeds and pumpkin seeds. Serve right away. You can make the pumpkin-seed topping up to a week ahead.